Most New England towns have a monument to their Civil War veterans. Many also honor their sons who fought in World War I, World War II, Korea and Vietnam. Bethlehem, Connecticut, is one of the few towns to honor its War or 1812 veterans. This year marks the bicentennial of the War of 1812. 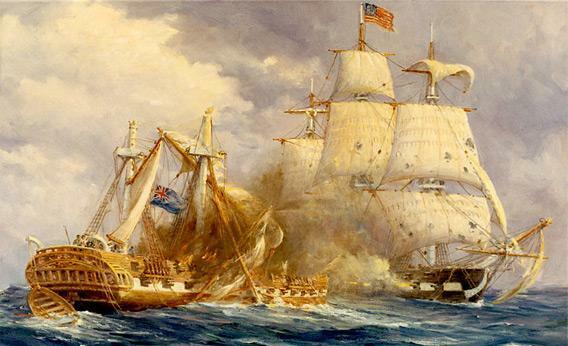 While the anniversary has been largely overshadowed by the Civil War sesquicentennial, the War of 1812 was an important event in the history of the young American republic. For the second time in 35 years Americans had stood up to the British, the world’s great power, and had held their own. The end of the war, followed by the American success at the Battle of New Orleans (word of the treaty reached Louisiana too late to prevent the battle) led to a surge in American nationalism and a spirit of political unity known as the Era of Good Feelings. Still, the war was quite unpopular in Connecticut. As much of the state’s economy was tied to trade with Great Britain, the state suffered financially from the decision to go to war. Connecticut’s entire Congressional delegation voted against the war. 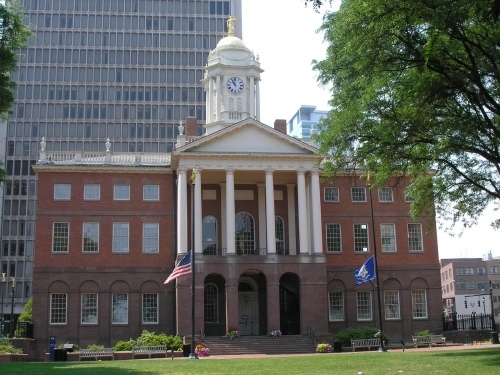 Many of Connecticut’s Federalist politicians supported the call for the Hartford Convention, an assembly of leading New Englanders concerned, among other things, with ending the war. Seven Connecticut representatives, including Nathaniel Smith of nearby Woodbury, attended the Convention, where calls were made for the secession of New England states from the Union. The end of the war and the results from New Orleans made fools of these men, most of whom saw their political careers ruined. 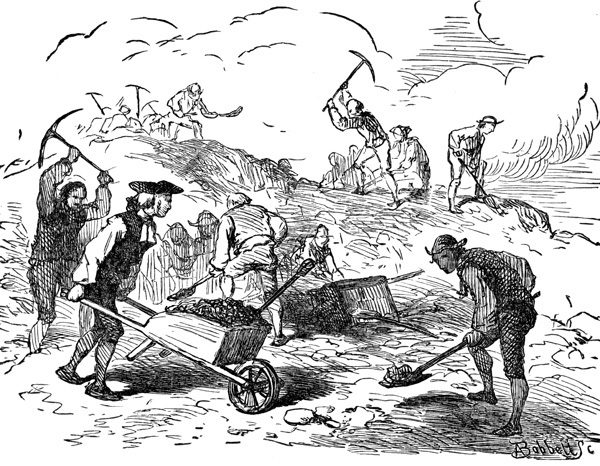 Residents of Stonington work on fortifications for their town, 1814. Connecticut’s opposition to the war was manifested in other ways, as well. While some 10,000 Connecticut men turned out for the war, the state government refused to allow the members of the Connecticut militia to leave the state. There was little military action in the state. An contingent of ships was trapped by the British at New London, but the appearance of a large group of state militia allowed the American sailors to escape. In 1814, a British fleet bombarded Stonington for three days, while $200,000 worth of damage was done to shipping concerns at Essex. 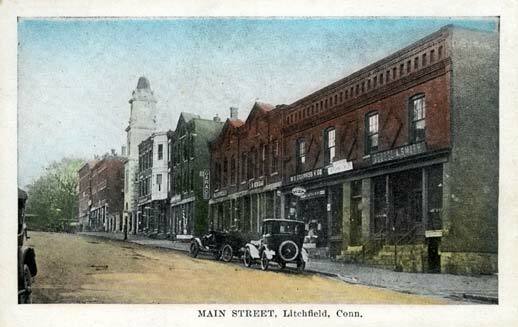 With hindsight, we know that the war had a minimal impact on Litchfield County. 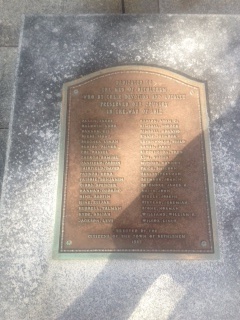 Statewide, there were 233 casualties as a result of the war. Few families of Litchfield would have felt the effects of the war. Still, the men of Bethlehem who enlisted to serve knew none of this. They joined the war effort with the belief that they would be thrust into action against the British, and were willing to make this sacrifice. 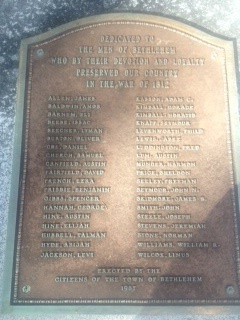 It is this patriotic spirit that the town of Bethlehem commemorated with this monument. This entry was posted in Architecture, History and tagged Bethlehem, monuments by pvermily. Bookmark the permalink.